We understand that care homes operate on close-margins and therefore costs and revenues need managing carefully. Core to managing care home finance is making sure you are not spending more than you need to and are billing correctly for the services you have provided. Sounds simple? We know it can be complex in a care home environment. CoolCare4 makes the central elements of successful financial management straightforward for all involved. If CoolCare’s software can automate it, it will. If not, CoolCare will bring it to users’ attention so it can be quickly acted upon. In short, CoolCare4 ensures that everything will be ship-shape by the time it comes to financial management. Care home fees are complex – different contributors paying different amounts on different terms – it’s never as straight forward as two plus two equals four! CoolCare4 will therefore help you manage all this with ease, relieving you and your team of mounting administration. You can set up rules which will automate as much of the fee-calculations as possible. The software will flag up when something needs your attention. Set up rules for automatic deductions and calculations based on contract terms. Your invoices will be correctly adjusted following discharge or for periods of absence. Got the fees wrong or a resident has changed funding status? Simples. Just apply the new fee from the date of change. CoolCare4 will calculate any back-dated adjustments required. Residents may take advantage of the visiting hairdresser or chiropodist. All billable extras can be logged here and added to the overall fee. 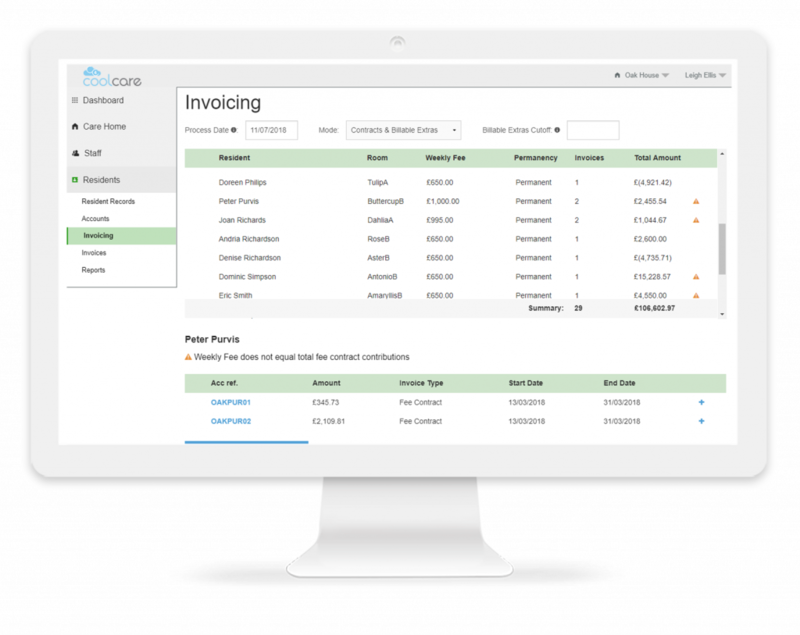 Print all your invoices directly from CoolCare4. You can amend your header and footer text either across your group of care homes, at home level or even for an individual resident. Using an Sage or Xero as your care home finance accountancy package? Use CoolCare4’s CSV uploads to transfer that all important invoicing info straight across. Protecting data has never been higher on a care home’s agenda. If you are contracting with an LA or NHS, chances are they won’t want their staff to see residents’ names on invoices. By setting the anonymisation rules, you can either use a preset reference or auto-generate a URN which will be applied to the relevant invoices. CoolCare4’s easy to use ledgers means that you can look after spend in the home wherever you are. The running balance will allow for quick reconciliation and all submissions without receipts will require explanation. Whether a credit or a debit, you will be able to keep track of how money is being collected and spent in your home. Fed-up of that Ground Hog day feeling of signing off small spends? 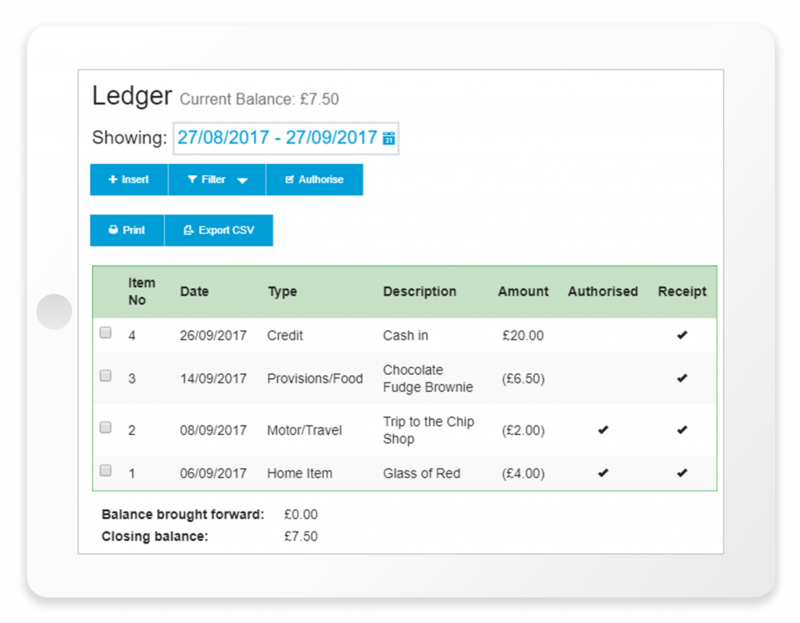 With CoolCare4’s ledgers, you can see exactly what has been spent and authorised whilst keeping track of receipts for accounting purposes. Keep track of your running balance and define the types of items your home can purchase and preferred suppliers. Need somewhere to keep a record of donations to your residents’ fund? Want to keep your eye on how it’s being spent? CoolCare4’s Home Ledger helps you audit any funds received as well as purchases made out of the fund. With a live running total balance, you can plan your fundraisers if needed or take the decision to buy that gazebo the residents have been hankering after. We all love our contactless pay these days- the less cash the better- but for many residents, a cash transaction is reminiscent of their spending habits of the past. Monitoring and auditing residents’ individual monies can be time-consuming. With a simple ledger for each resident on CoolCare4 and the ability to run-off reports, a quick check that everything balances is so much easier. Key financial information about fee levels and income, as well as enquiries and occupancy, will help with revenue generation – and forecasting – to enable quick reaction to business needs. 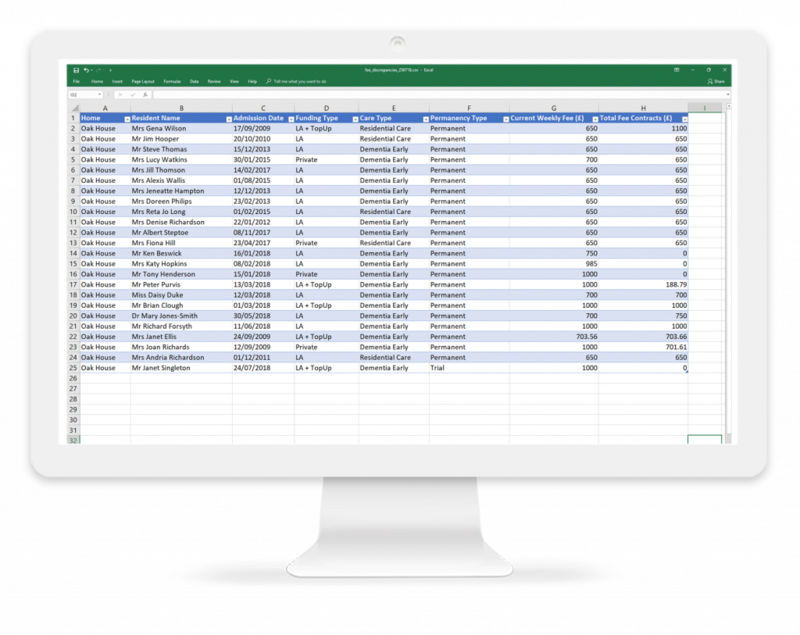 Many of our reports are also available in a CSV format so you can use the data how you want to. That means prior to running your invoices, you can be sure that you are charging the right amount. You can check for any fee discrepancies, missing contracts and then check your income analyses against your invoiced amount to ensure everything adds up.